Sparkle Herman never let snow bother her. Blizzard conditions are forecast for the day with up to 18 inches of snow predicted. It’s March 6 and our plowman is running out of room to push the snow in our long driveway and turn circle. We’ve even had to have our peaked roof shoveled 3 times. The January thaw never came this year so the snow has accumulated all winter. Schools are closed- again. No doubt the school kids are cheering but our Greyhound boys look shell shocked, wondering if this winter will ever end. There’s no point in going to work so I stay home and shovel the steps and path to the gate 4 times during the storm. Our 11 year old Greyhound Boomer is blind and navigates the steps easier when he can smell them. Bernie, our 9 and one half year old Greyhound is having the hardest time adjusting to nature’s abundance as he can’t blast around the acre and a half we have fenced and it’s too hard to take leash walks in the woods. The dogs have to walk single file in the tracks around the yard that my husband has stomped out with snowshoes. As the falling snow accumulates during the day I dress our 12-year-old Dalmatian girls in their fuchsia parkas and we head out cross-country skiing in the back forty. Despite their age they love every minute of this glorious winter, as endurance running is their forte. With the arrival of darkness, the blizzard intensifies. I have skied a loop around the house for the dogs and my husband has snow shoed this particular trail again. When I take the dogs out for last pee we get half way around the house and, e-gads, I’m up to my hips in a snowdrift. Laughing at the absurdity, I crawl out on top of the snow. Bernie is behind me, caught up to his shoulders in whiteness, looking at me most helplessly. The Dalmatians blast past him, stirring up enough snow so he and Boomer can make their way forward. We get back home and I ponder that another storm is predicted to arrive in a few days. Most dogs joyously welcome the arrival of winter and our Greyhounds are no exception. The first few snowfalls are great to frolic in. They dash around in the soft fluffy stuff and love to eat it. Both our Greyhounds have fairly thick coats for the breed and prefer cool weather. As the snow pack accumulates and their mobility is hampered cabin fever can develop when their regular exercise and time outdoors is restricted. Some dogs will react with destructiveness. In Bernie’s case, he becomes anxious. The broom, coat rack and stairs appear foreboding and he runs nervously by them, reminiscent of his behavior when he was newly adopted. He sticks to his bed all day with a worried look on his face. With the snow so deep it’s impossible for him to fly out the door and run around. Gone are the days of lying under the white birches in dappled sun listening to the birds. A number of years ago we thought he could join us cross-country skiing in the woods during a very snowy winter. We positioned him between my husband and myself with the other dogs thinking he would stay in the ski tracks. Over one half mile from home instinct beckoned and he hopped out of the tracks and took off in the woods after who knows what. Fortunately my husband and the Dalmatian detectives found him off our property on an old logging road we never go on. Would he have made it home on his own before hypothermia set in? Needless to say that was the last time we gambled with his life. I remember a newly adopted Greyhound that wasn’t so lucky one winter. He ran off and fell through thin ice on a lake and died. Our treatment for the Greyhounds’ cabin fever started about 5 years ago when Boomer went blind. Most of the year they get the majority of their exercise in our fenced yard and the woods behind our house. With Boomer’s loss of vision combined with the difficulty dogs have scenting a trail in the snow we started taking both boys for walks down our quiet road in the winter, since it was plowed and easy to walk on. 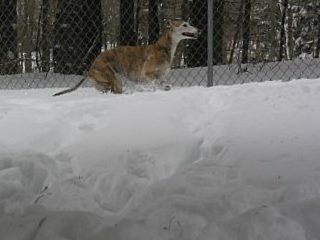 We would also go cross-country skiing in the fenced yard so the Greyhounds could join us safely. As the winter of 2001 started shaping up to be a whopper I took them for walks in a new development near us for a whole new sensory experience. We’d hop in the car and drive to one or both parks that are fairly close, encountering other people and dogs that were also treating their cabin fever- a great opportunity for the Greyhounds to send and receive fascinating pee mail. I would take Bernie, the social butterfly, to visit friends and neighbors for a little stimulation and visit the local feed store where he could pick out treats. We made a number of trips to Bradbury Mountain, 8 miles from our house where we’d take the short, slightly strenuous hike up to the summit. The exercise invigorated both of us and I would take in the beautiful view of the snow-covered landscape while Bernie got attention from other winter sports enthusiasts. When we’d return home from our jaunts the boys would lay on their beds high on exercise released endorphins, heads up with happy faces, mouths open, still savoring the exciting olfactory input they had encountered. I liked to think when they slept afterwards it was because they were truly tired and not just exhausted from boredom. I hoped they had returned home with lots of new dream material to spice up their sleep. The final tally for the winter of 2001 was 99 inches of snow, which is a lot for the Portland, Maine area. St. Paddy’s Day arrives and with a couple days of 45 degree weather the snowmelt has begun in earnest. The first sign of spring surfaces: Bernie’s favorite toy – a deflated basketball. Crocuses won’t appear for 2 more weeks. It is easier for him to dash around outside now, beloved ball in his mouth. All is well in the world, from his point of view. I have visions of mud season with 16 dirty dog feet. And after that the steamy heat of summer when we don’t have the stamina to do much outside except in the early morning and evening. At that point we will be eagerly awaiting the first snowfall. Winter can be a spectacular time of year. With the proper clothing and some effort you and your Greyhound can enjoy this season. Get a good winter dog coat, preferably with an attached turtle neck, or purchase a neck/head piece (sold as “snoods”) separately. Consider a single layer fleece coat for warmer winter days and a fleece coat with a waterproof shell for the coldest days. Try dog booties, especially on extremely cold days or for dogs with sensitive feet. To acclimate the dog to booties put one on at a time until the dog gets used to it. Dogs that don’t wear booties will need their feet cleaned off if they walk in salt and other chemicals used to melt snow and ice. These substances can be harmful to dogs if ingested when licking paws. Keep toe nails trimmed to prevent the dog’s toes from splaying which reduces traction on ice and can cause injury. If your dog doesn’t wear booties and snowballs form on the bottom of his feet, making walking difficult, clip the hair between the toes even with the bottom of the foot. Long hair between toes reduces traction. Elderly and ill dogs are less tolerant of cold. Don’t overdo their outdoor time and consider using a lightweight fleece coat indoors for warmth if your house is cool. Don’t leave your dog in an unheated car for prolonged periods. In cold weather a car acts as a refrigerator. If you have a fenced in yard remember the height of the snow pack diminishes the height of the fence. If it appears that your Greyhound could jump over the fence use a leash when out. Keep the gate area cleared of snow to make sure it closes all the way and doesn’t allow a dog to squeeze through. Don’t let your Greyhound run free. More dogs are lost during winter than in any other season as they can lose their scent in snow and ice. Beware that ponds, lakes and rivers may have thin ice and dogs and their human rescuers can fall through and drown. Do not exercise your dog on snowmobile trails, as this can be very dangerous. Frostbite may occur on tissue with prolonged cold exposure, restricting blood flow especially to ear tips, tail and foot pads, potentially causing tissue death. Areas covered with hair make early symptoms easy to miss. Initially skin turns pale and becomes red and painful as it warms. Suspected areas should be warmed gently with warm water and should not be massaged. Contact a veterinarian for care. Hypothermia occurs when a dog’s core temperature falls below normal. Dogs with short coats, very old dogs and dogs that have been submerged in cold water are most susceptible. Violent shivering is an initial symptom. It may progress to lethargy, coma and cardiac arrest. A wet dog should be dried vigorously. Wrap a hypothermic dog in warm blankets and place bottles filled with warm water covered in towels in the arm pits and groin areas. Seek immediate veterinary care for this medical emergency, especially if the dog’s rectal temperature is below 95 degrees Fahrenheit. Don’t expect your dog to just hunker down for the winter. Provide him with exercise and stimulation by walking in accessible areas: parks, shoveled sidewalks, quiet plowed streets. Visit pet supply stores and the homes of friends and relatives. Make an effort to get out. Your dog will appreciate it and you will enjoy it too. I emailed her, Linda. She should get back to you soon. Can you get me the e-mail address for this author so that I can use this article in our upcoming newsletter. An excellent article regarding cold-weather care of our pups. Thanks.